Last night, I attended a webinar by Larry Johnson, Chief Executive Officer of the New Media Consortium (NMC), who chatted with moderator Steve Hargadon about the NMC Horizon Project. You may be familiar with the Horizon Reports, which track the top technology trends for the coming five years in higher education, K-12 education, and museums. The Horizon research has significant implications for libraries and the broader information field, but before discussing that, let’s go over yesterday’s presentation. Johnson was proud to say that the Horizon Project has just celebrated its 10th anniversary. They published the first Horizon Report in 2004, at which time they were focused solely on higher education because that was what they were familiar with (Johnson worked in the field for many years, including a position as president and CEO of Fox Valley Technical College in Wisconsin). He also feels that at that time, no one was working across sector lines, so they stuck with higher education. Four years ago they began looking at K-12 education, and there are now three separate editions of the Report, each published annually: higher education, K-12, and museums. In addition, they produce regional technology outlooks, which are specialized reports that are usually funded by either a coalition of educational institutions or the local government, and these cover regions around the globe. Each Horizon Report begins with a group of 45-50 experts from at least 20 different countries weighing in on what they believe to be the most important upcoming tech trends. The NMC draws these experts from a variety of fields, including journalism, industry, education, and the blogosphere. They ask them to name the two most important technologies coming down the pipe on each of three time horizons: one year or less, 2-3 years, and 4-5 years. This process produces a list of 80-100 technologies, which gets whittled down to two in each adoption horizon. All of this data is put into the Horizon Navigator, which has become a massive repository of information about educational technology. Every day, the group monitors the news and published research in various languages, and all of the findings go into the Navigator. They have recently introduced an iPad app that covers the top ten news stories each week; these articles are curated from the hundreds of publications they track. To demonstrate how the Report changes from year to year, Johnson listed the six trends for K-12 from 2011 and compared them with the 2012 list. As one example, cloud computing was removed from the list because it’s already here, and the Reports are about what’s coming. Mobile technology was already on the 2011 list, but in 2012 they combined this with apps. Tablets were also added to the 2012 list; Johnson noted that the iPad essentially created a whole new category of technology. Hargadon asked whether there were examples of technologies that either were included on the list but failed to live up to expectations, or came up so quickly that they were nearly mainstream before making it onto the list. Johnson explained that they had started tracking virtual worlds (such as Second Life) early in 2006, and soon people became quite excited about the possibilities. Unfortunately, the technology never moved forward, partly because there was so little competition. On the other hand, cloud computing came along so quickly that they were barely able to write it up before it was a reality. Johnson feels that all the tech they’ve ever mentioned has been important in some way and has taught them about the possibilities out there. Johnson also covered some key trends that are not specific to certain forms of technology but that reflect the impact of technology on education. One of these trends is the growing popularity of BYOD (Bring Your Own Device). In the past, the attitude towards mobile devices in the classroom was that they were a negative distraction, but now that more students are carrying them, educators are exploring how they can use them constructively. The webinar wrapped up with a brief discussion of tech differences based on geography and a mention of the Horizon Project Retreat, where 100 thought leaders from 20 countries spent 3 days discussing 10 megatrends (for example, we spend many years learning informally after leaving school, so what can we learn from informal learning that would make formal learning more effective?). The Horizon Reports are clearly valuable tools for academic and school librarians, as well as public librarians who serve young people. If we know what technologies our students will be using in the near future, we can start planning now to accommodate their needs. A library that stays on top of the most important trends will stay relevant for its users, and considering the length of time required for most major library projects, the only way to stay on top is by planning ahead. For example, a library might want to build a mobile app right away but also start doing initial research into game-based learning. However, these reports should also be of interest to other information professionals. Tech trends that will hit higher education in 2-3 years will hit the workforce a year or two after that — maybe sooner — as new graduates begin their careers and bring their preferences with them. Anyone working with those graduating from post-secondary in the past few years benefits from current and evolving technologies. Of course, most libraries and resource centres don’t have the money or staff time to implement every technology mentioned by Horizon, but even simply being aware of the trends is valuable. Consider a student who comes to the library asking for help performing research on her iPad or tablet or iPhone. The librarian takes a look at the device and thinks, “oh oh….I’m not really comfortable using that…” Now compare that thinking and response to the thinking and response of another librarian, who readily links the student to a website that explains how to connect to the library’s resources. Even if a particular library isn’t able to produce their own research guide, they could likely find information online created by another library that will answer their students’ questions. The Reports are available under a Creative Commons license. 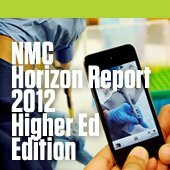 To download them, just create a free account at the NMC website and select a report from the Horizon Reports page. As always it is the parents and teachers who should make education relevant to students. Technology must become an inclusive tool. Where alll can obtain access to hardware and applications.Notebooks, iPads, and netbook computers — paid for with the help of state dollars — are becoming an increasingly common sight in classrooms.